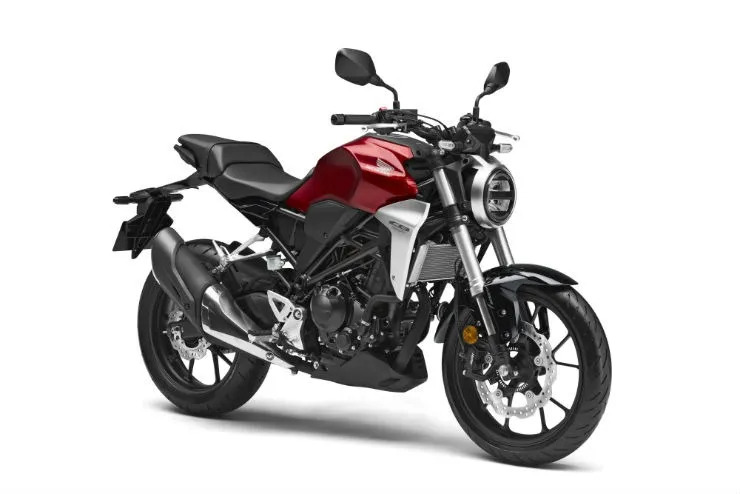 Honda launched its much awaited naked bike, the CB300R, in February this year. The bike has been priced at Rs. 2.41 lakhs (ex-showroom) which makes it slightly cheaper than the KTM 390 Duke. 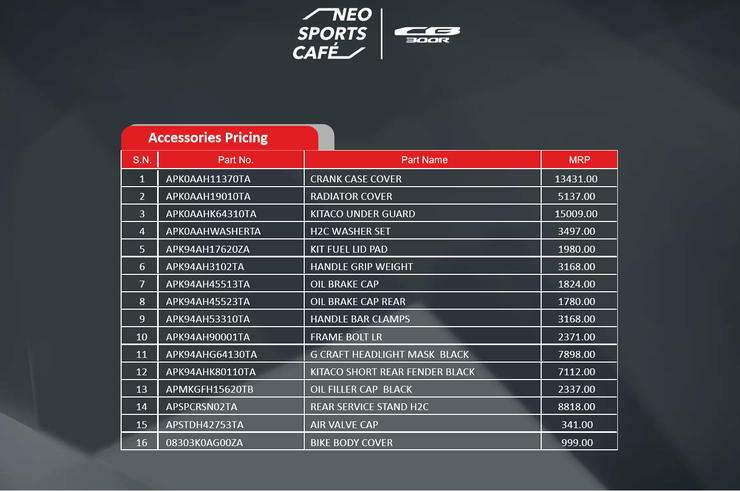 Now, the details and pricing of the accessories available for the naked bike are out and offer a slew of choices for the buyers. The prices for these accessories start from Rs. 341 for an air-valve cap and go all the way up to Rs. 15,009 for a Kitaco under guard. Also, the accessories can either be purchased individually or in the a bundled kit format. 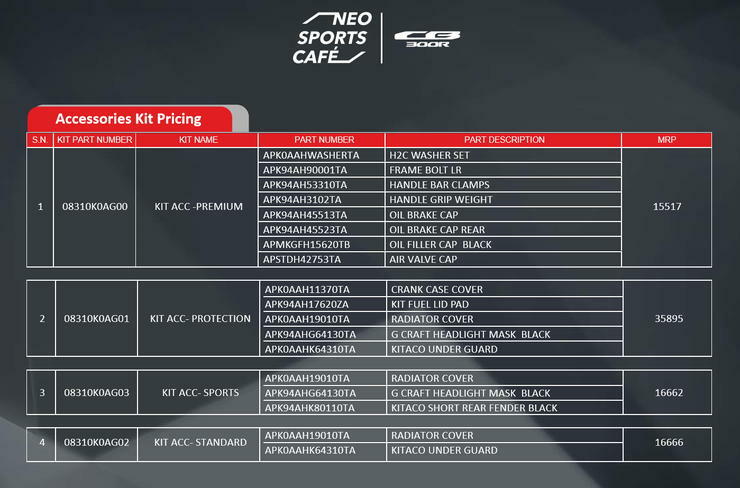 Honda has grouped the accessories in four kits, which are, Premium, Protection, Sports and Standard. Among these four kits, the Premium kit is the most affordable one and is priced at Rs 15,517. The Premium kit includes stylish bar-ends, brake reservoir caps, air-valve caps among others. They are more aesthetics oriented and will improve how the bike looks. Then comes the Protection kit, which is priced at Rs 35,895. It includes a crankcase cover, fuel lid pad, radiator guard, headlight mask and a Kitaco under guard. Next in line is the Sports kit, which is priced at Rs. 16,666. It includes a radiator guard, headlight mask and a Kitaco short rear fender. Lastly, the Standard kit is priced at Rs 16,666 and includes accessories like a radiator guard and the Kitaco under guard. As already stated, the accessories can either be bought in the form of kits or individually, depending upon the buyers choice. The bundled kits though offer the same accessories at a discounted price as compared to buying them individually. As seen in the picture above, the individual priding of the accessories is more than when combined in kit form. However, one can go for them if they feel no need of buying the full kits but just need some components for their new CB300R. 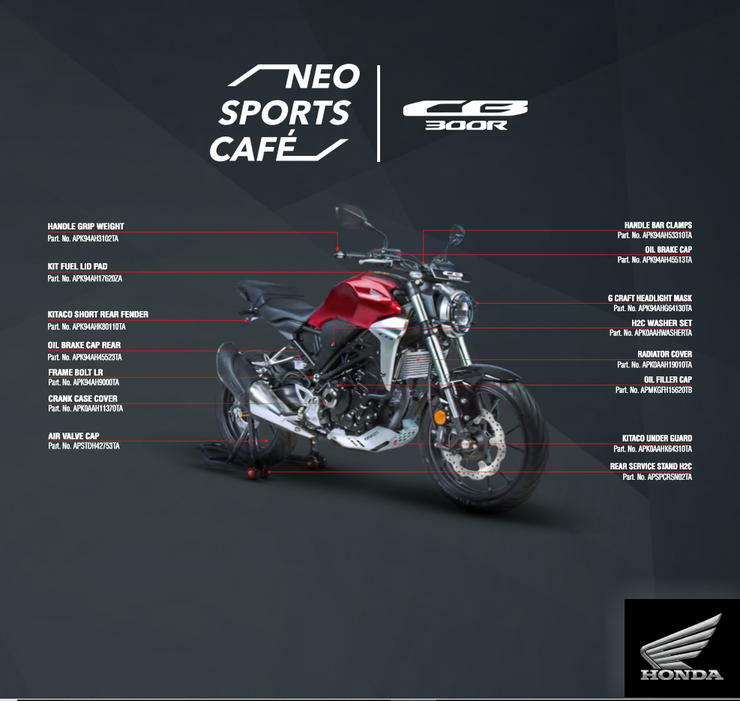 The Honda CB300R is powered by a 286cc single cylinder, liquid cooled motor that churns out a good 31 Bhp of peak power at 8,000 rpm and 27.5 Nm of peak torque at 6,500 rpm. This is the same engine which was found on the CBR 250R but now has been bored out for increased displacement. The engine comes mated to a six-speed manual transmission. Another important feature of the bike is that it gets dual channel ABS as standard along with an Inertia Measuring Unit (IMU) which distributes braking of the ABS. In its segment, the Honda CB300R faces competition from the likes of the KTM 390 Duke and the BMW G 310R. Both the bikes are more powerful than the CBR300R, though more expensive also. The 390 Duke’s engine churns out 44 Bhp of power and 37 Nm of torque while the BMW G 310R produces 34 Bhp of power and 28 Nm of torque. The KTM 390 Duke is priced at Rs. 2.43 lakhs and the BMW G 310R is priced at Rs. 2.99 lakhs. Also, the 650 twins offer some competition too, though they are from a different riding segment.